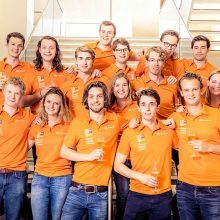 The Nuon Solar Team consists of sixteen students of Delft University of Technology. It is a multidisciplinary team, composed after an extensive selection period. Students from various faculties make up the team, coming from a.o. Aerospace Engineering, Mechanical Engineering, Electrical Engineering, Industrial Design, Applied Physics and Technical Management. With their technical knowledge, creative visions and practical course of action, they managed to keep their World Champion solar car racing title, winning the 2017 Bridgestone World Solar Challenge in Australia with their newest solar car, Nuna9. It was the seventh time for the Nuon Solar Team to take home the World Champion trophy. The first time the Nuon Solar Team competed at the World Solar Challenge was in 2001, with their very first Nuna solar car. The Nuon Solar Team will be presenting their agile practices and eight winning factors that helped them win the World Solar Challenge seven times so far.